Established and operating since 1994 as Nation’s Mini-Mix, Inc., our mix on-site concrete offers a unique system providing small yardage concrete delivery. We are dedicated to producing the highest quality concrete and delivering it to you in the most expedient manner. No more long hours of heavy labor mixing sacrete, no waste and no messy clean-up! 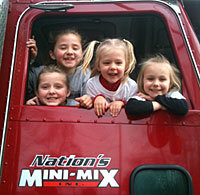 Nation’s Mini Mix is a locally owned family business! We have been operating out of Coburg, OR since 1994, specializing in small yardage concrete delivery and specialty mixes. If you have seen the big red mixing trucks, that’s us! We haul all the components of concrete on our truck and mix onsite, guaranteeing that you are getting the freshest concrete possible. Nation’s Mini Mix is dedicated to providing the highest quality concrete and excellent customer service for every customer on every job. There is no job too big or small for Nation’s; we have four trucks that are available to deliver concrete, so whether you have a big shop slab or just a small piece of sidewalk, we can bring as much or as little as you need to get the job done. 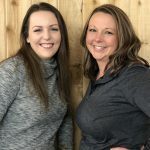 Our courteous and friendly staff are always here to help! 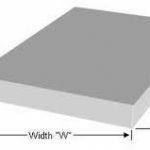 How much concrete do you need for YOUR job? A fast and easy way to estimate the cost of your project. I liked you guys before–more so now. Thank for your effort!